Watching the country side pass you by, using the river as your road and the cruise ship as your bus, stopping at cities or other interesting site along the way, River Cruises are really much more comparable to a land tours than ocean cruises. Land tours have a much smaller passenger list than an Ocean Cruise and local experts to guide and provide information. It’s no wonder land tours are so popular and effective way to visit another country. However, despite how effective and popular land tours are, this type of travel has downsides. There is little to do while moving from place to place except look out the window (the alphabet sign game anyone?). Once you get to your next stop, you unpack yet again. While you may have freedom to wander some areas, sleeping in or just relaxing in you room for the day is not a real option, as your bed is not on the bus. Finally, while the service is often quite good, it’s often impersonal simply because you’re not in one place long enough to get to know the staff. River Cruising offers a much more relaxing way to get around! With river cruises, your ship becomes a comfortable, floating riverside hotel. You unpack once, vacation the rest of the cruise! The ship is usually docked right in the heart of each port, and while there is a world of adventure outside the stateroom, your day may call for extra pillows and room service,and that is perfectly ok with the cruise line! Speaking of the service, cruising in general is well known for the spectacular service provided to its passengers, River cruises are no exception. Your needs and preferences become quickly known and remembered. You have the option to have as much freedom as you like or as much guidance as you want. Effectively, you can simply relax and enjoy your destination. Ocean Cruisers – Love the cruise experience but are perhaps looking for a bit of variety from the typical ocean cruise? If you are looking for a deeper, more enriching travel experience, River Cruising maybe for you! Travel Groups – Are you an educated, curious adult, who travels with friends and family? Or a couple/solo traveler(s) interested in taking advantage of the group amenities while exploring cultural wonders of the world, River Cruising maybe for you! You! – Frankly anyone with even a passing interest in river cruise will likely enjoy the experience. Since you requested a guide on River Cruise, I am guessing you have at least a passive interest. Be able to explore your curiosity about fantastic parts of the world. Meet new people that have similar travel interests and are from around the world! Appreciate tasting and learning about the food, drinks and arts of different cultures. Taken care of while travelling. Someone else will worry about the details, so you don’t have to. How Does River Cruising and Ocean Cruising compare? The biggest difference between ocean cruises and river cruising is the focus on the destination, rather than on the ship itself. IE, it’s about being immersed the area, not being on a big ship with waterslides and a rock wall. FOOD / DRINKS – You’ll be treated daily with regional foods, wines and beers, sourced fresh every day. ENTERTAINMENT – You’ll be entertained by local performers who come on board for an evening show or event. MORE/LONGER PORT STAYS – Arrive in port earlier, and/or stay in port later. When was the last time you enjoyed a city’s night life during an ocean cruise? When you go ashore, history and culture will come alive with the help of guides who live there and speak the language, and you will usually be in a much smaller group than with an Ocean Cruise. River Cruises, as with ocean cruises, the fare includes your accommodations, your meals, and your on-board entertainment. Fewer crowds and less standing in line? Overnights or Late Nights are common with river cruises, giving you a chance to explore the nightlife of a city. What is the best River Cruise Itinerary? In most cases, your itinerary will be available in two different directions (Amsterdam to Basel, or Basel to Amsterdam). The cruise direction really doesn’t matter as the experience is nearly always the same in either direction. The Mississippi, Columbia and Snake rivers in the U.S. These are just the larger rivers accessible by the largest River cruise ships (120 or so passengers) Smaller River barges with 1 or 2 staterooms make nearly any river a floating retreat! If you are having a difficult time choosing (and who would at this point), start by asking yourself, “Where part of the world is on my bucket list?” Then contact me to help you find the right River Cruise to start your adventures, We will find the right itinerary together! Many cruise lines also offer ‘special interest’ cruises on select sailings. These cruises help you experience your destination while catering to your special interests at the same time! You’ll love the onboard presentations by subject experts, special activities, and more… all at no additional cost. Wine or Beer appreciation Cruises are extremely popular, but there are many other options as well. Literary Cruise with an author as a special guest. With the internet and local channels churning out news of horribly acts on a seemingly daily basis, many potential river cruisers are concerned about traveling safety throughout the world. They wonder if it is just too risky to take a vacation, let alone a river cruise. Statically speaking, these unfortunate events can happen anywhere, not just overseas. However, nothing is ever 100% safe, and there are risks in many of our daily activities. The cruise lines have a vested interest in your safety, so they carefully monitor security threats and take appropriate actions to ensure their passengers are as safe as possible. It might be best to cruise here at home! There is no right or wrong answer and you should always do what is best for you and your family! Keep in mind that if you’d rather not travel internationally, you could always take a river cruise right here at home. There are a number of US River Cruise lines that offer very popular river cruise itineraries right here in the United States. Mississippi or the Columbia/Snake Rivers are the obvious choices, but and there are many other options. What is the best River Cruise company? I get this question a lot, but honestly, it’s the wrong question! What you should be asking is which Cruise Line has the best options for you? No matter which river cruise lines you choose, you will most likely have the vacation of a lifetime. Most of the River cruise lines really have more in common than the true differences, what really sets them different are the inclusions and itinerary. However, having all the inclusions in the world doesn’t make a difference if it’s something that you won’t take advantage of. For example you get free cocktails, but you don’t drink, that’s not a great a great option for you. But a river cruise with bicycles on board for use in each port may be a terrific option if you love to ride ! River cruises, as a whole, offer a lot more than a typical ocean cruise, so finding these extras just puts icing on the cake. Even if you choose a less inclusive cruise line, you won’t be ‘nickel and dimed’ for the extra purchases. Usually the ‘extras’ available on a river cruise (bar drinks, premium excursions, ect.) are priced reasonably and it’s similar in cost to what you would pay from a local vendor. AmaWaterways focuses on fine dining. Their Executive Chef – Primus Perchtold (winner of three gold medals at the European Championship of Culinary Art) has one of his recipes placed on your pillow every night, so when you go home, you can recreate his culinary magic! As the only river cruise line to be inducted into the Confrerie de la Chaine des Rotisseurs, AmaWaterays can truly deliver on a fine dining experience. Avalon emphasizes ‘bigger rooms, better views, and fewer passengers’. Their Open Air Balconies feature 11-foot floor-to-ceiling, wall-to-wall sliding doors. When the doors are open, your entire stateroom turns into a comfortable, indoor balcony. In addition it’s the only cruise line that has the beds facing view, rather than facing the wall. Uniworld emphasizes ‘six star’, boutique river cruising. – By partnered with their award-winning sister company, Red Carnation Hotel. Uniworld has created the world’s only authentic boutique hotel experience on the rivers. Each of their ships are one-of-a-kind, each a work of art, designed to be as unique as their guests, and as inspiring as the destinations they visit. Viking focuses on their expertise, and the value they offer. They have been recognized consistently by both Condé Nast Traveler and Travel + Leisure for their outstanding quality, as well as being named “Best River Cruise Line” multiple times by Cruise Critic. These additional questions can help decide which cruise line to use. Do they have bicycles / walking sticks available for use at port stays? What choices are available as dining venues while on board? Is there an on board pool, hot tubs and/or fitness center? What are the loyalty programs for repeat customers? What excursions that are included as part of the fare? How price friendly are River Cruise lines to Solo Travelers? A river cruise can be a terrific vacation for a solo traveler. Open seating at meals and smaller excursion numbers are conducive to meeting people and making friends. Special Interest cruises can ensure you traveling with people with similar tastes. River cruise lines tend to be very price friendly to solo travelers (as compared to the ocean cruise lines or other travel tours). Many of them offer single supplement waivers or discounts to make solo travel much more affordable. If you are interested in Solo travel, contact me and we can discuss the different options available through different cruise lines. One thing to note, Solo specific staterooms (where offered) sell out quickly and usually you will need to book far in advance to guarantee your savings. Occasionally, there will be promotions from various cruise lines, where the single supplement is reduced or waived for solo travelers. My connections with Travel Leaders grant me access to many of these offers that are not available to other travel professionals. Should I Get a Balcony or Suite? The real answer here is yes, you really should. However, river cruise ships do not have inside staterooms. So no matter which type of stateroom you choose, you’ll definitely have an outside view. Generally, there are four types of cabins on River Cruise Ships. However, not all of these cabin types will be found on every ship. Stateroom features either a half or full window. The window is usually ‘fixed’ i.e. it doesn’t open and if often just above the water giving a spectacular view of the river. Single staterooms, for solo travel will most often be a Riverview stateroom. In River Cruise ships, these stateroom usually features a full-size window (wall to wall, floor to ceiling). The windows open in such a way to make your entire room the balcony. Stateroom features a small private seating area outside your cabin, much like an ocean cruise balcony. Suites are much larger staterooms, sometimes with a separate bedroom. Nearly always, suites represent the most luxurious stateroom offered on ship and often come with additional amenities not available to non-suite guests, for example, several river cruise lines offer butler service exclusively to suite guests. These will typically offer a either a balcony, or two! On several River Cruise ships, suites are the only staterooms available. Cabin sizes and styles vary widely between the different cruise lines. When is the best time to River Cruise? Most European rivers have a season starting in April and runs through October; however a couple European rivers stay open through the year-end holidays. Many rivers outside of Europe offer year round itineraries. Note that a large number of Itineraries offed by river cruise lines are Special Interest Cruises and as such only offered along a special time line. Avalon Waterway, for example has a Springtime Tulips Itieniaries (Tulips of Northern Holland) that only operates in April and sometimes early May. As such only have a single price point that may have little difference between the few weeks it travels, however it may have a couple different ships operating that Itinerary and offer different price points due to the different ships accommodations. Typically off peak will be as the season opens, and closes, with the exception of the last week or two of the year as Christmas River Cruises are becoming extremely popular! However, it’s not uncommon to see off peak pricing along the summer months as well. If price point is a major concern, it’s worthwhile to check the pricing a few weeks before, and a few weeks after your ‘planned’ trip time to explore better pricing options. If you have a trip in mind and are frustrated navigating the different options (pun intended!) Give me a call or send me an email, let me help sort the details! How can weather affect my trip? Mother Nature doesn’t always play well with the travel industry, and much like all form of travel, bad weather can affect your vacation plans. In heavy rains and flooding, the river ships may be unable to pass under bridges. Likewise, low water levels may also prevent river ships from travelling a river. It’s not common, but it does happens and as all the river cruise ships are generally the same size, they are affected equally by bad weather. There is no way to predict if (or when) this is going to happen. Water levels can change very quickly… often too quickly to warn passengers before they depart from home; however the River Cruise Line will make every effort to ensure you can enjoy the vacation you paid for! If you book a river cruise and at the last minute become concerned about water levels, don’t cancel your river cruise without checking your travel insurance policy as weather conditions may not be covered! I always pictured river cruises like the dinner scene in the movie Titanic, full of wealthy people all dressed up in fine clothes. The dress code on river cruise ships is typically Country Club Casual. What does that mean to those that don’t frequent country clubs on a regular basis? Typically – slacks and a shirt with buttons at dinner (no blue jeans). That’s not to say you can’t dress up nice, there are plenty of events where a nice dress, or suit (or even formal wear) will be appropriate, but it’s not mandatory. How can I get the best price on a river cruise? There are 2 guaranteed methods to getting a terrific price on a river cruise. Much like airlines, ocean cruise prices seem to fluctuate from day to day (and even hour to hour). It’s a matter of waiting for what seems like the best deal, and then jumping on it. In contrast, with river cruises, the price is THE price. Online agencies wont have a bevy of discounted fares to sort through as typically catalogues are printed for at least a year in advance. There is a huge and growing demand for river cruises right now, and the demand far exceeds capacity. River cruises consistently sell out on almost every sailing. River cruises DO go on sale, but usually the further away from the sail date, the better the price. In fact because river ships are so small, it’s nearly the only way to guarantee you get the room type you want at the best possible price! Most river cruise ships typically only have around 80 cabins available. Smaller luxury river barges may only have 1-2 cabins! River cruise cabins not only fill up very quickly, they usually stay full. Plan your river cruise as far ahead as possible. You’ll pay less, AND you’ll have the best selection. Just like ocean cruise booking in groups offer better values by providing some prices breaks and additional amenities. If you have between 8 and 16 people traveling with you on a river cruise, there are a lot of options available. 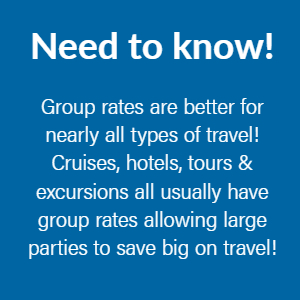 Please contact me for details on how you can maximize your possible discounts on group travel. There is a 3rd way of getting a terrific price on a River Cruise that I will outline in an upcoming email. I don’t include it here as it’s a sporadic method of getting a deal. As a travel agent associated with Travel Leaders, I have access to some outstanding prices, as well as special incentives not commonly available to other travel agents. I can leverage my connection with Travel Leaders to get you terrific prices on your river cruise. Have more questions about a River Cruise? Just Ask!